Do your headlights seem dim while driving at night? Is it difficult to see? Do your headlight lenses look foggy, hazy, or yellowed? Not only does unrestored headlights take away from the look of your car, they also reduce the efficiency of the headlight itself. Drive safely at night again! Headlight restoration is the process of removing the oxidation and re-applying a protective UV coating. Are you able to see what you need to see? A car with cloudy lenses is UN-SAFE! 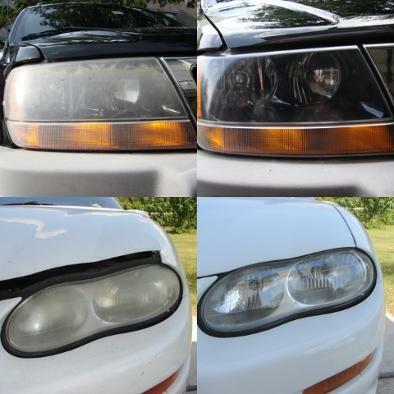 Fix those cloudy lenses today and restore your headlights back to their original brightness! 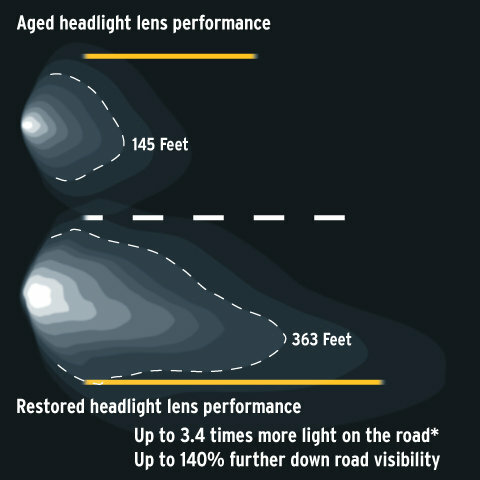 As your car ages, sunlight and road debris take a toll on your headlight lenses. After time, lenses do not project the same amount of light because it is being blocked by a haze. Whether you want to improve the look of your car, increase night driving visibility and safety or to sell it faster and get more $ for it, you can trust us to amaze you and deliver professional service. Starting at $45.00 per headlight, this service will result in immediate safety benefits and will pay for itself at resale time. It is a terrific value when considering the safety of yourself and/or loved ones. Our extensive multi-step process will eliminate much of the haze that is present allowing for up to 3.4 times more light on the road with up 140% more visibility. Note: Results may vary depending of overall deterioration and ageof lens. Replacement of head lamp may be needed.